Vogue, October 1997. Photo: Sean Ellis. Stylist: Isabella Blow. 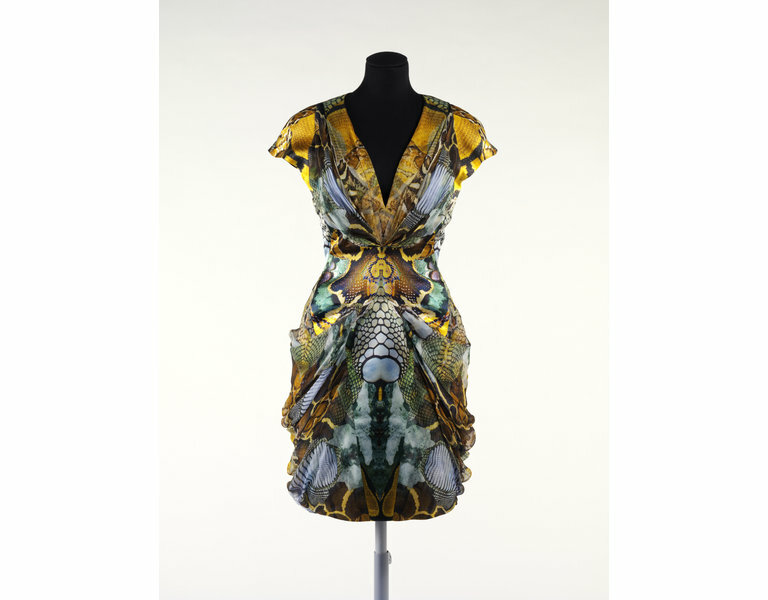 The London incarnation of Alexander McQueen: Savage Beauty has just opened at the Victoria and Albert Museum. 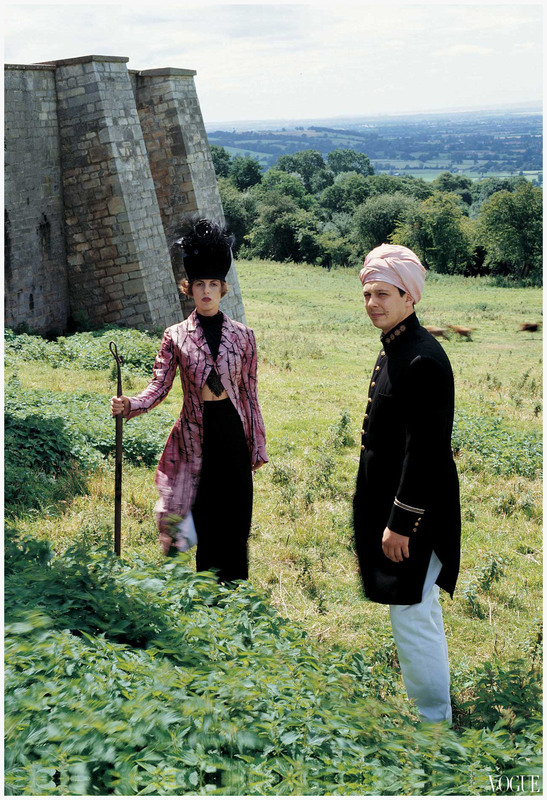 (See British Vogue on the additions to the Costume Institute show.) Accompanying the exhibition is a full calendar of events, including a two-day conference in early June. The exhibition catalogue is available in hardcover and paperback from the V&A, with a North American edition to be published by Abrams in May. Several London galleries are hosting related exhibitions. At Proud Galleries, McQueen: Backstage – The Early Shows by Gary Wallis presents Wallis’ behind-the-scenes photographs from McQueen’s early career (to April 5, 2015; book). Tate Britain’s Nick Waplington/Alexander McQueen: Working Process brings together Nick Waplington’s photographs of The Horn of Plenty (FW 2009), recently published in his 2013 book (to May 17, 2015). At the Gallery at Foyles, Inferno: Alexander McQueen – Photographs by Kent Baker will present backstage photographs from Dante (FW 1996) (March 20 to May 3; book). And next month, London College of Fashion’s Fashion Space Gallery will host Warpaint: Alexander McQueen and Make-Up (April 30 to August 7, 2015). Natalia Semanova in Alexander McQueen for Givenchy, Vogue Russia, December 1999. Photo: Arthur Elgort. Editor: Katharina Flohr. Image: tumblr. 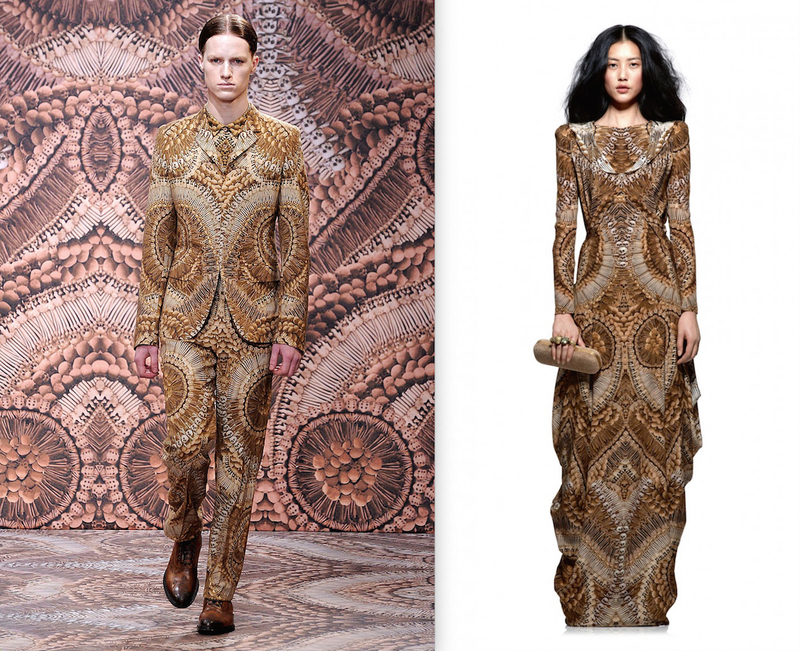 This week, the final instalment of my three-part series on Vogue Patterns’ Alexander McQueen designs for the house of Givenchy. (See Part 1 here; see Part 2 here.) Our last four designs were drawn from two Givenchy collections presented in 1999: the Fall 1999 and Spring 2000 ready-to-wear. Givenchy ad campaign, Fall 1999. Photo: Craig McDean. Image: tumblr. 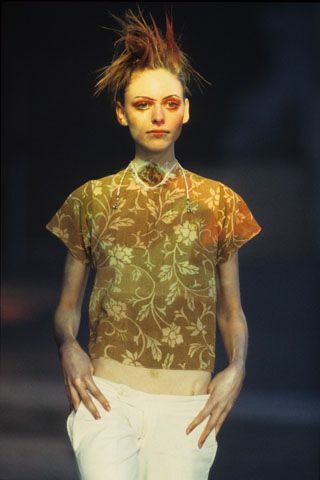 As its android-meets-cybergoth runway styling made abundantly clear, the Givenchy Fall 1999 ready-to-wear collection took its theme from the new millennium. 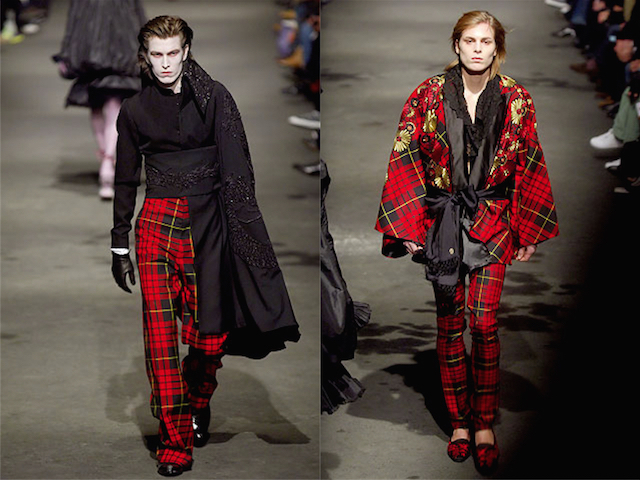 The New York Times’ Cathy Horyn reported that “Alexander McQueen … staged his Givenchy show Wednesday with models in Martian pancake and frizzled wigs walking robotlike down a mirrored runway beaming with airport lights. The collection vividly showcased Mr. McQueen’s laser-sharp tailoring—lunar-white trouser suits with crosses etched out in gray fur, slick coats with the couture equivalent of clear plastic upholstery covers, silvery leathers and a molded red top that would enhance any alien bosom” (Cathy Horyn, “Down to Earth in Paris”). 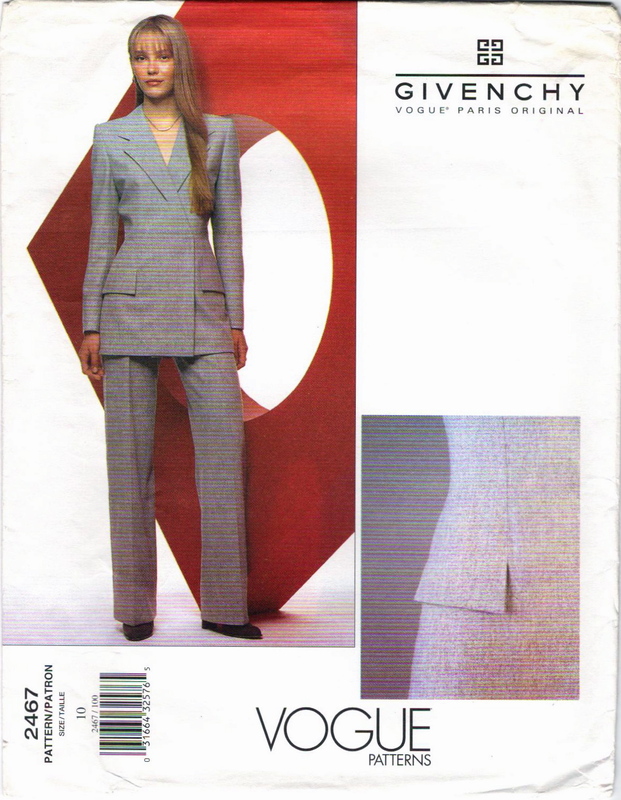 Vogue 2467 by Alexander McQueen for Givenchy (1999) Buttonless double-breasted pantsuit. 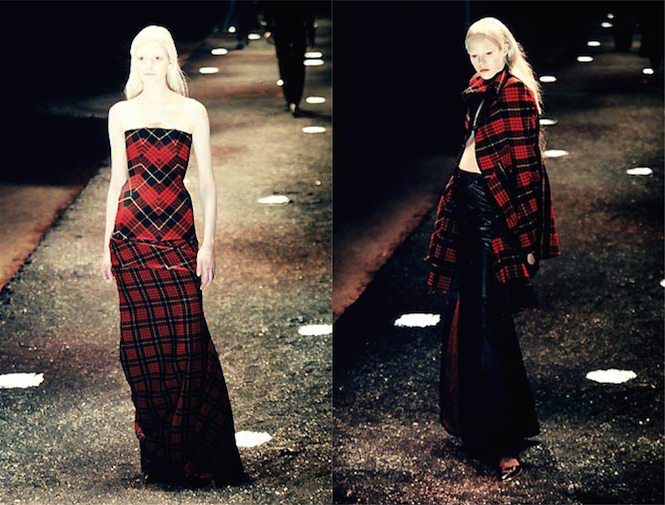 Givenchy Fall 1999 ready-to-wear by Alexander McQueen, L’Officiel 1000 modèles 1999 no. 5. Image: jalougallery.com. Update: You can now view this collection on vogue.com. 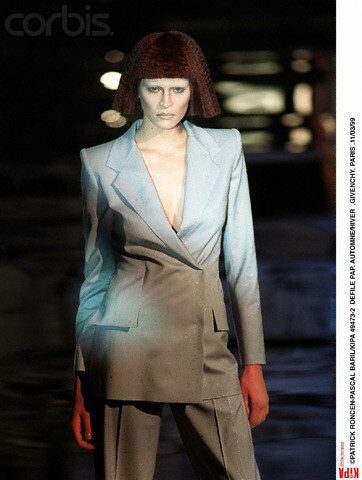 Vogue 2478 by Alexander McQueen for Givenchy (2000) Pantsuit with inverted lapels. 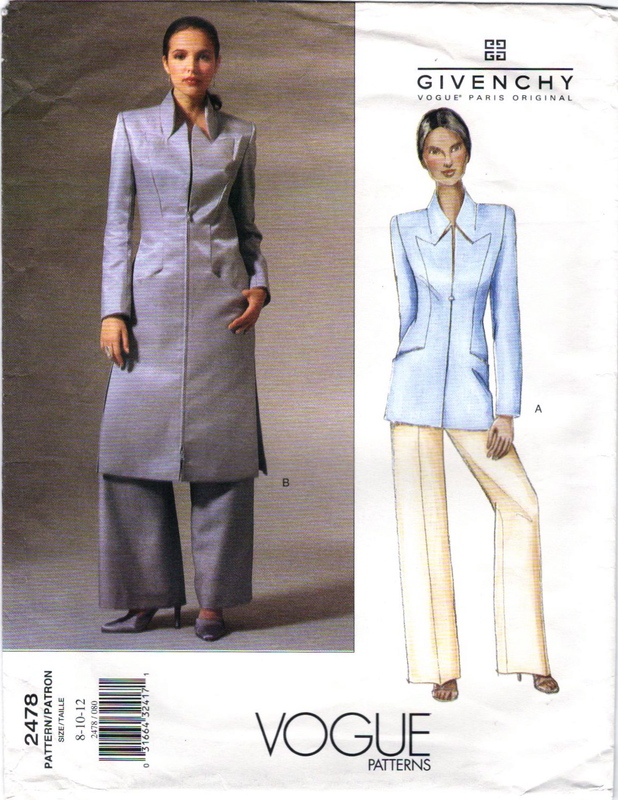 The envelope description reads: Misses’ Jacket & Pants: Semi-fitted, fully interfaced, lined, below-hip or below-mid-knee jacket has upper collar and side-front cut in-one, shoulder pads, side-front pockets, side-back seams, front zipper and longer than regular length, two-piece sleeves with mock vent. B: side slits. Wide-legged, floor-length, lined pants have front button waistband, welt pockets and mock-fly zipper. 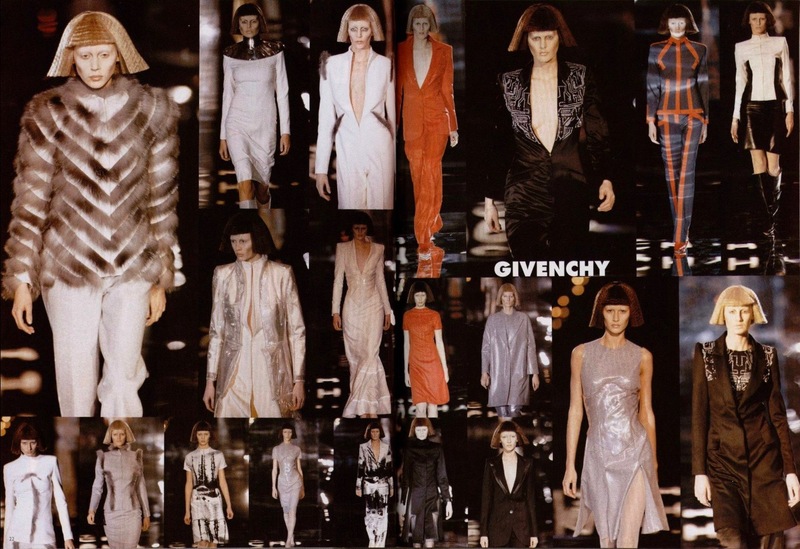 Givenchy ready-to-wear Fall/Winter 1999-2000. Model: Liisa Winkler. Image: Corbis ©Baril/Roncen. Natalia Semanova in Alexander McQueen coat and jumpsuit for Givenchy in “Sekundy do Starta,” Vogue Russia, December 1999. Photo: Arthur Elgort. Editor: Katharina Flohr. Image: Wired. 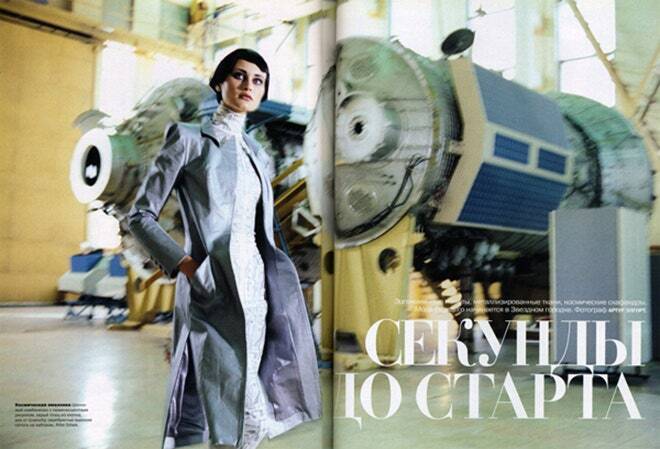 Natalia Semanova at Star City, Korolyov, Vogue Russia, December 1999. Photo: Arthur Elgort. Editor: Katharina Flohr. Image: Wired. Givenchy’s polyester, elastin and Lurex metallic suit, by Alexander McQueen. W magazine, September 1999. Photo: Juergen Teller. Model: Claudia Schiffer. Stylist: Michel Botbol. 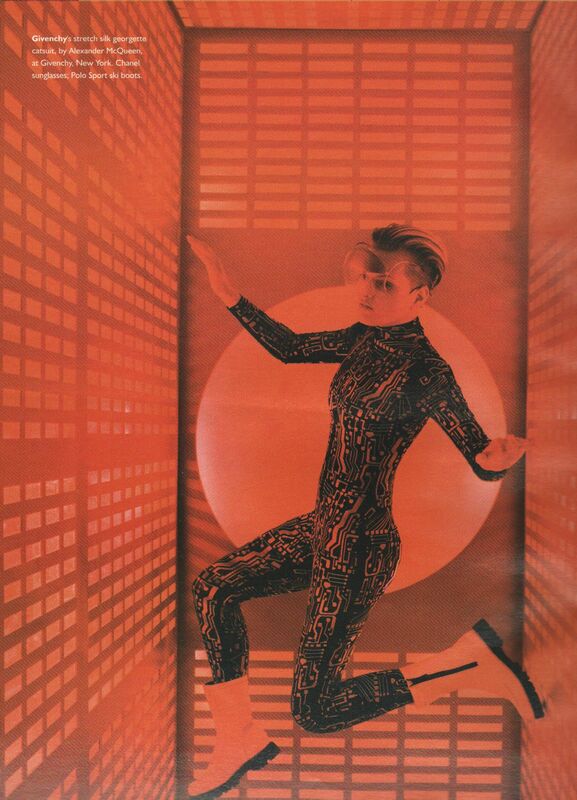 Givenchy’s stretch silk georgette catsuit, by Alexander McQueen, W magazine, January 2000. Photo: Michael Thompson. Model: Guinevere Van Seenus. Stylist: Joe Zee. Karen Elson in Givenchy’s Spring 2000 advertising campaign. Photo: David Sims. For this “sporty” collection, the Carrousel du Louvre was transformed into a high school gymnasium, with the models posing on a tiered podium. The Spring collection is viewable on style.com vogue.com. 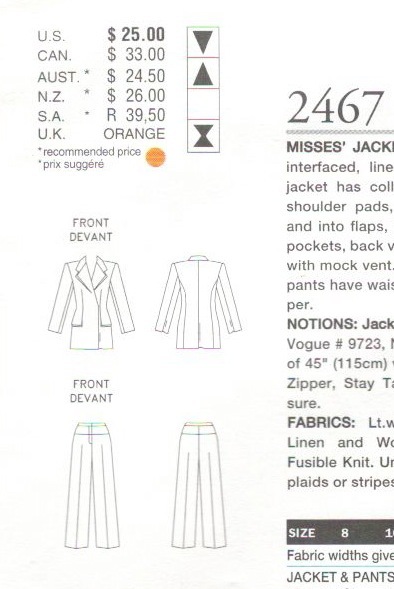 Here’s the envelope description: Misses’ Jacket & Pants: Semi-fitted, lined jacket, mid-calf (center back) has collar, shoulder pads, side panels, no side seams, pockets, self-lined lower back and long, two-piece sleeves. Below waist, tapered or straight-legged pants have shaped waistband and fly zipper. A: lower calf, side back seams with pleat/zipper. B: side front pockets. Purchased top. 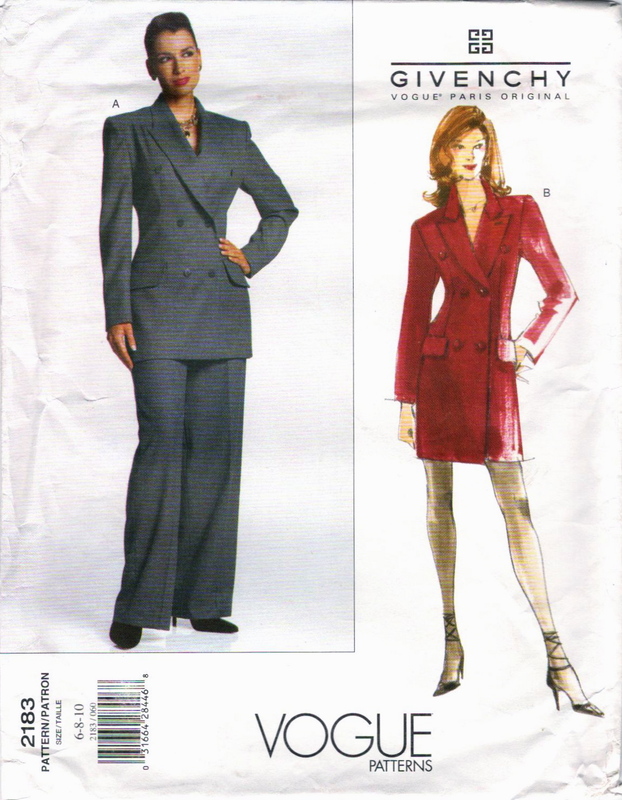 Featured in the November/December 2000 issue of Vogue Patterns magazine. 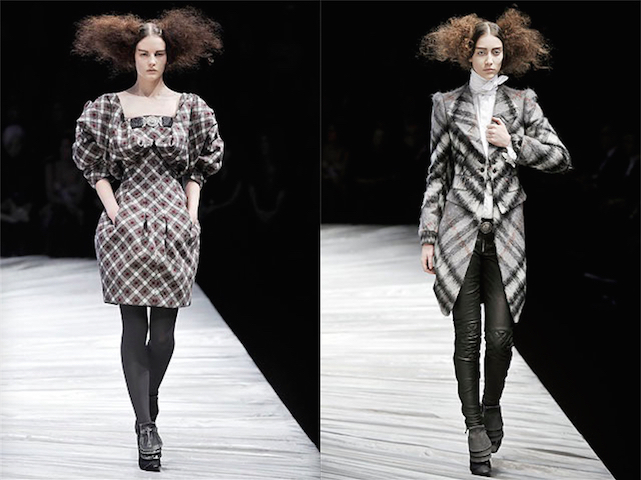 Runway photos of the Spring/Summer 2000 collection show the variations on Vogue 2486’s updated tailcoat. As you can see, the purple version on Angela Lindvall is sleeveless and has a longer tail, while the sleeveless, leather version on Gisele Bündchen has a narrower tail. The purple suit also shows the collection’s athletic wear-inspired pant cuffs, which are omitted from the long pants in Vogue 2486. Givenchy Spring/Summer 2000 ready-to-wear. Image: style.com. Angela Lindvall in Givenchy Spring/Summer 2000 ready-to-wear. Image: style.com. Gisele Bündchen in Givenchy Spring/Summer 2000 ready-to-wear. Image: style.com. Givenchy Spring 2000 ready-to-wear by Alexander McQueen, L’Officiel 1000 modèles 1999 no. 8. Image: jalougallery.com. 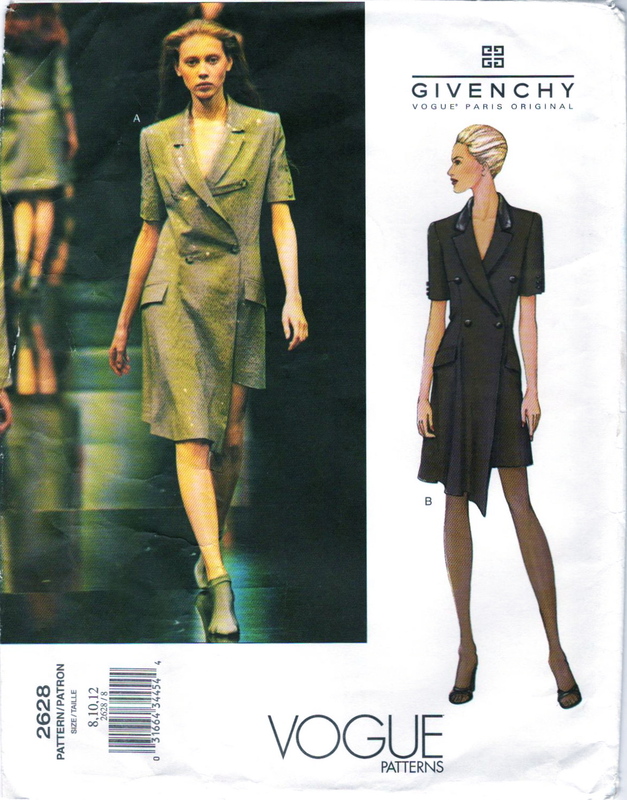 Vogue 2653 by Alexander McQueen for Givenchy (2002) Skirt suit/pantsuit with decorative hand stitching. 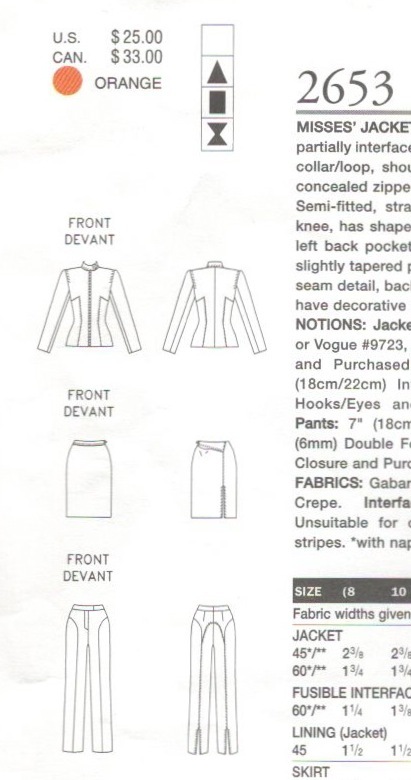 The envelope description reads: Misses’ Jacket, Skirt & Pants: Semi-fitted, partially interfaced, lined, above-hip jacket has collar/loop, shoulder pads, seam detail, front concealed zipper and long, two-piece sleeves. Semi-fitted, straight, lined skirt, above mid-knee, has shaped yokes, right back seam/slit, left back pocket and side zipper. Semi-fitted, slightly tapered pants have contour waistband, seam detail, back slit and fly zipper closing. All have decorative hand stitching. 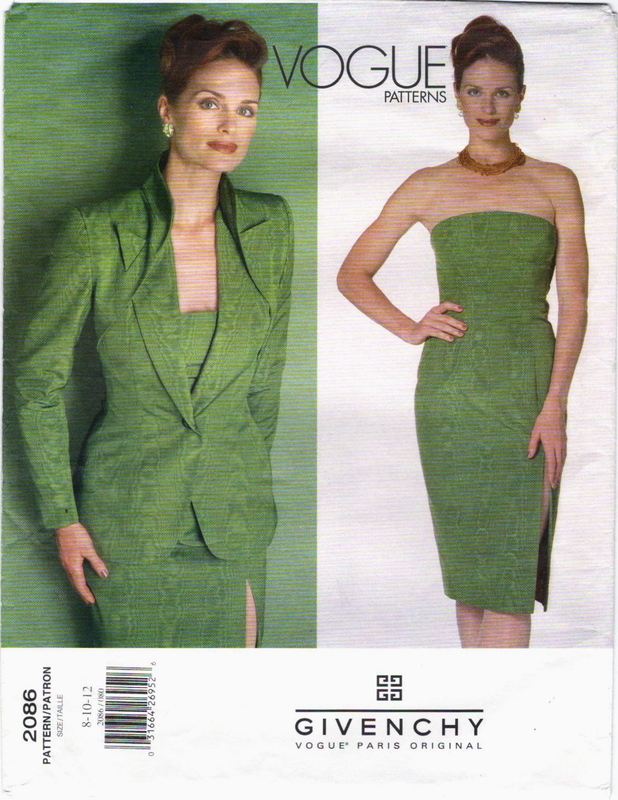 Featured in the April/May 2002 issue of Vogue Patterns magazine (Shop Vogue). Givenchy Spring/Summer 2000 ready-to-wear.Image: style.com. The decorative stitching seen in Vogue 2653 was also showcased in the Givenchy Spring advertising campaign featuring Karen Elson (above). —from Purple Fashion, Summer 2007, quoted in Alexander McQueen: Savage Beauty. British Vogue, April 1997. Photo: William Klein. Image: Nicolas Jurnjack. 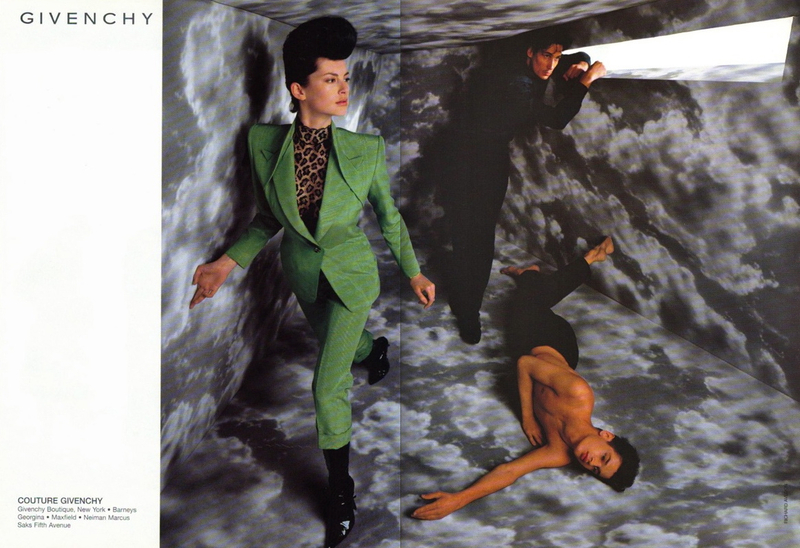 Erin O’Connor in the Givenchy Fall 1998 ad campaign. Photo: Steven Meisel. This week, the second instalment of my continuing three-part series on Alexander McQueen’s Givenchy designs for Vogue Patterns. (Read Part 1 here.) 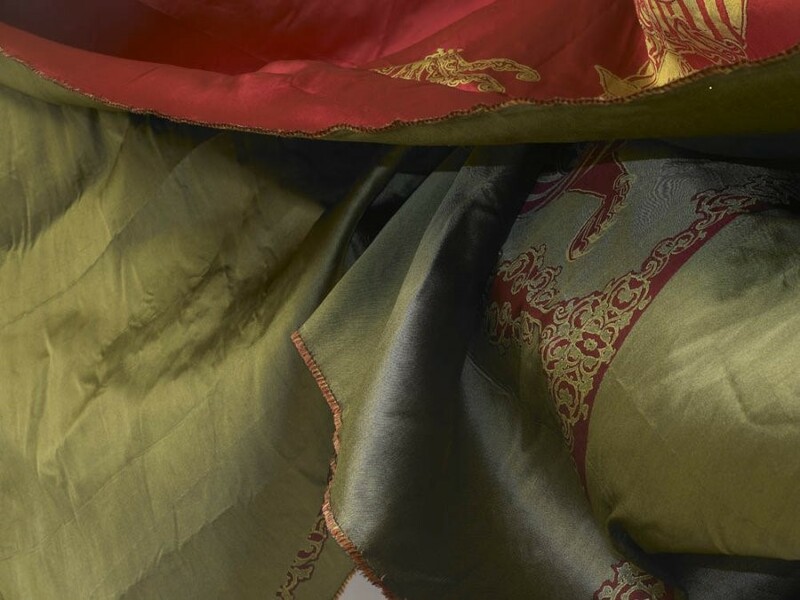 Our next four patterns were drawn from three Givenchy collections presented in 1998: the Fall 1998 and Spring 1999 ready-to-wear, and the Spring 1998 couture. Givenchy couture by Alexander McQueen, L’Officiel, March 1998. Photo: Riccardo Tinelli. Editor: Guylaine Tilleau. 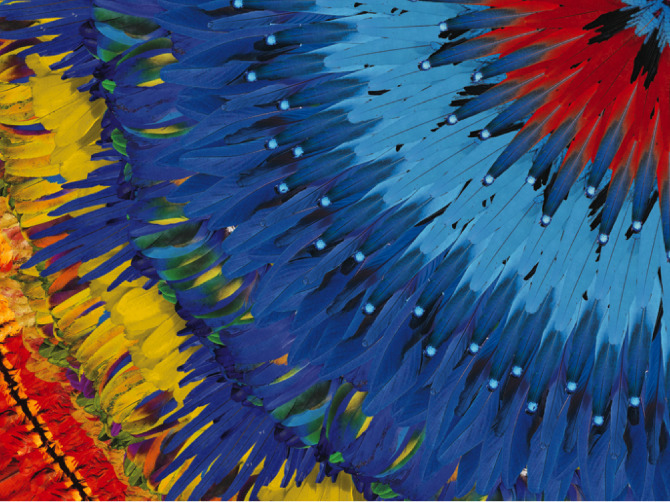 Image: jalougallery. 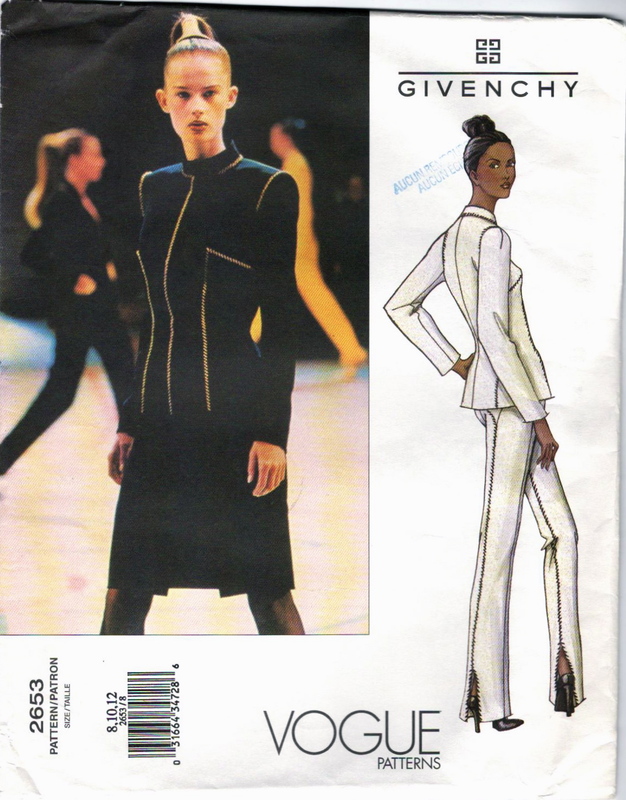 Vogue 2343 by Alexander McQueen for Givenchy (1999) Tuxedo jumpsuit. 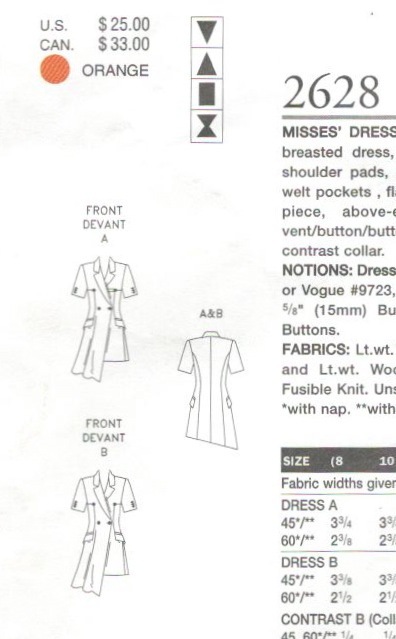 Here’s the envelope description: Misses’/Misses’ Petite Jumpsuit: Semi-fitted, lined, straight-legged jumpsuit (loose-fitting through hips) has collar, shoulder pads, welt/side pockets, side zipper, front button trim and long, two-piece sleeves with mock vent/button trim. B: contrast upper collar/front facing. Purchased top. 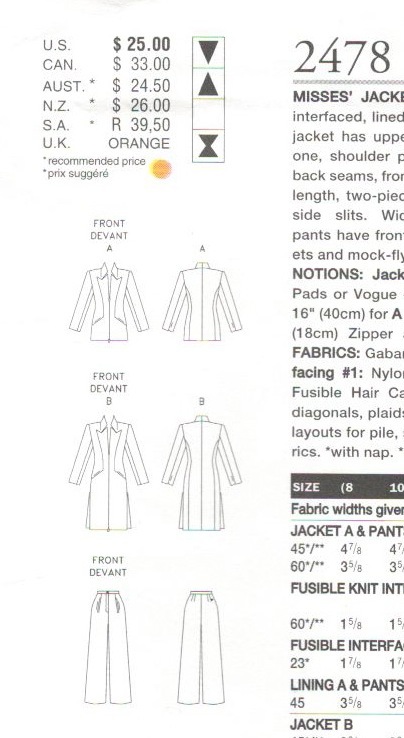 Featured in the November/December 1999 issue of Vogue Patterns (Shop Vogue). 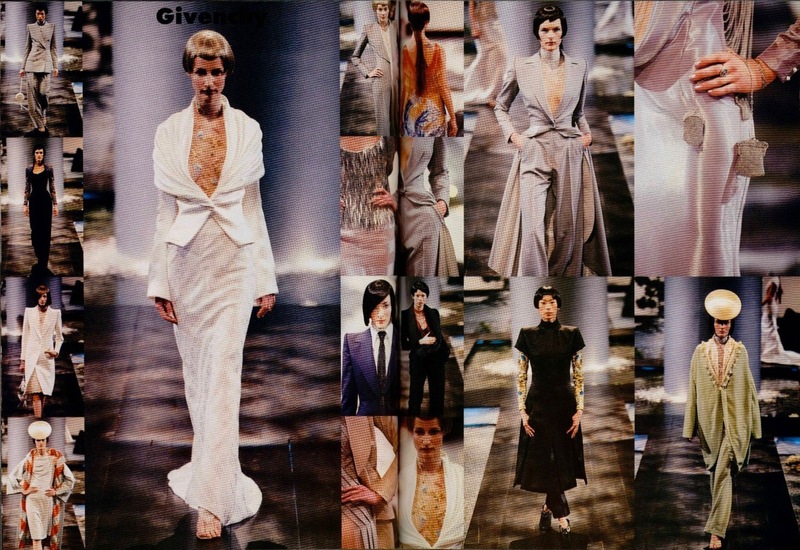 Givenchy Spring/Summer 1998 haute couture by Alexander McQueen, L’Officiel 1000 modèles 1998 no. 10. Image: jalougallery.com. Vogue Paris and L’Officiel both put this collection on the cover of their couture special. Could that be Michelle Behennah in the V2343 jumpsuit? Michelle Behennah in Givenchy couture by Alexander McQueen, L’Officiel March 1998. Photo: Thomas Schenk. Image: jalougallery. Jacket with pleated sleeves in Prince of Wales wool gabardine and matching straight skirt, Givenchy Couture. Vogue Paris, February 1998. Photo: Steven Klein. Stylist: Debra Scherer. 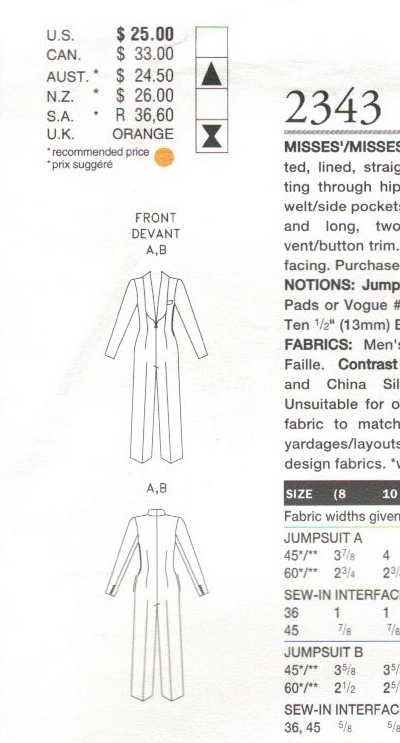 The Vogue 2343 jumpsuit was promoted in the magazine’s holiday issue. I’m fascinated by the fact that this pattern gives dressmakers and home sewers access to couture tailoring of this calibre. The design is probably my favourite of the series. 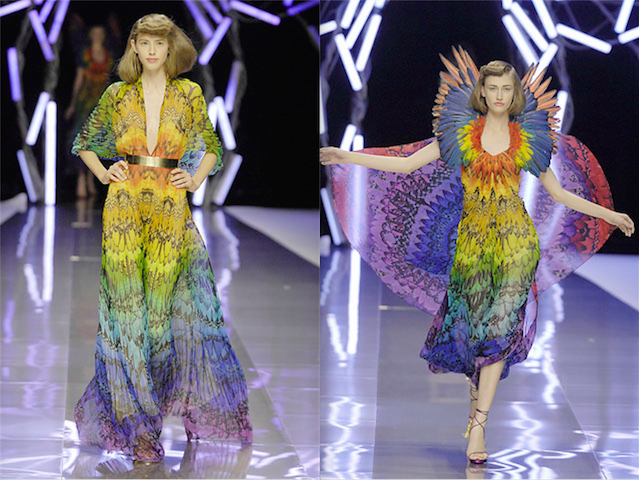 No parallel Alexander McQueen collection, since the designer didn’t produce haute couture collections for his own label. Jade Parfitt in the Givenchy Fall 1998 ad campaign. Photo: Steven Meisel. The Fall 1998-99 Givenchy ready-to-wear collection drew praise for its draped cowl necks, sleek tailoring, and its skilled use of leather and fur. 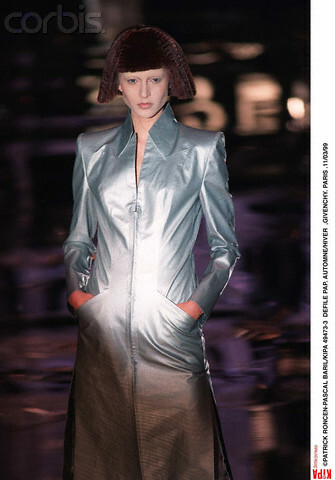 (See Suzy Menkes, “McQueen Makes Peace With His Heritage” and Anne-Marie Schiro, “McQueen Pilots Givenchy Boldly Into the Late 90’s.”) In May, WWD announced the renewal of McQueen’s contract with Givenchy, which had been due to expire with the Spring 1999 ready-to-wear (Bridget Foley, “McQueen Renews Givenchy Contract”). For the Fall runway show, the models were made up with vampy red lips, their hair in exaggerated 1940s-style rolls. Givenchy Fall 1998 ready-to-wear by Alexander McQueen, L’Officiel 1000 modèles 1998 no. 12. Image: jalougallery.com. Vogue 2228 by Alexander McQueen for Givenchy (1998) Faux fur-trimmed skirt suit. 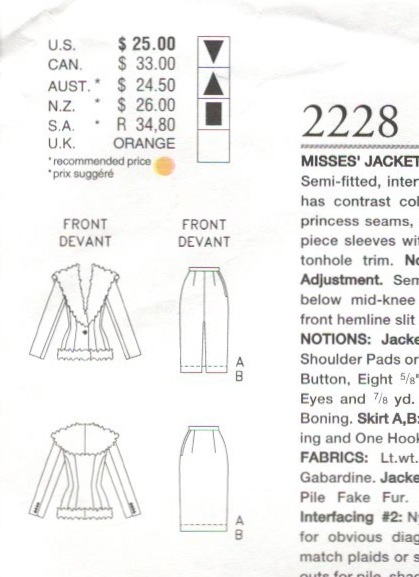 The envelope description reads: Misses’ Jacket & Skirt: Semi-fitted, interfaced, lined above hip jacket has contrast collar/hemband, shoulder pads, princess seams, no side seams and long, two-piece sleeves with mock vent and button/buttonhole trim. No provision for above waist adjustment. Semi-fitted, tapered, lined skirt, below mid-knee or mid-calf, has waistband, front hemline slit and side zipper. 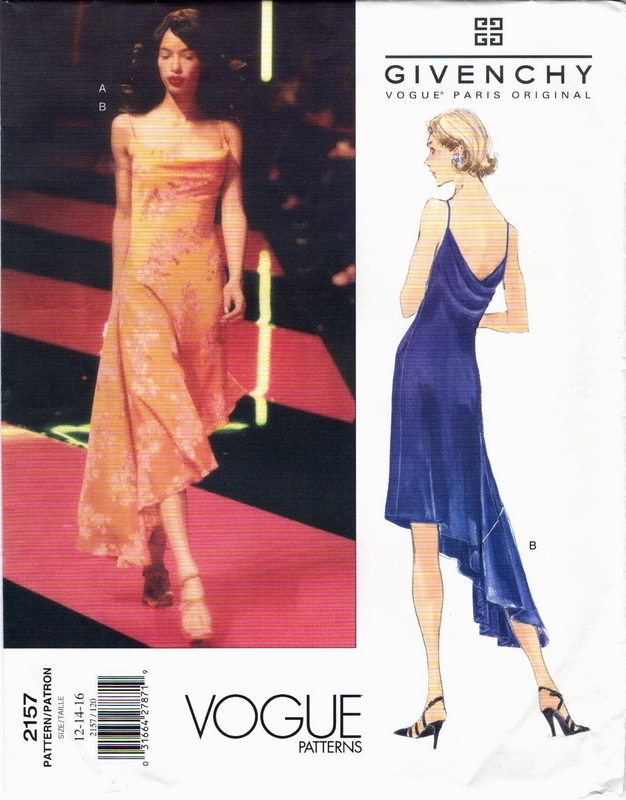 Featured in the January/February 1999 issue of Vogue Patterns magazine (Shop Vogue). 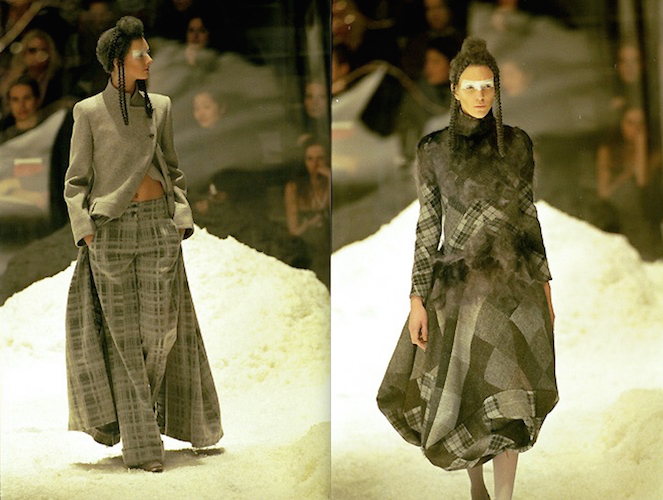 Givenchy ready-to-wear Fall/Winter 1998-99. Image: firstVIEW via TFS. Erin O’Connor in the Givenchy Fall 1998 ad campaign. Photo: Steven Meisel. Image: eBay. Vogue 2248 by Alexander McQueen for Givenchy (1999) Dress with contrast cowl neck. Here’s the envelope description: Misses’ Dress: Fitted, tapered, lined dress, below mid-knee or mid-calf, has contrast cowl, front slit and back zipper. A: long sleeves. B: sleeveless. The pattern recommends chiffon for the contrast cowl. 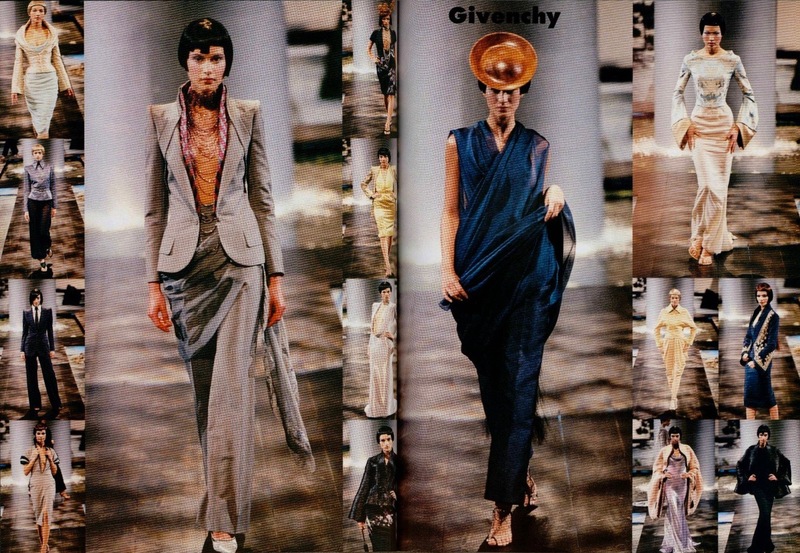 Givenchy ready-to-wear Fall/Winter 1998-99. Image: © Thierry Orban / Sygma via Getty Images. 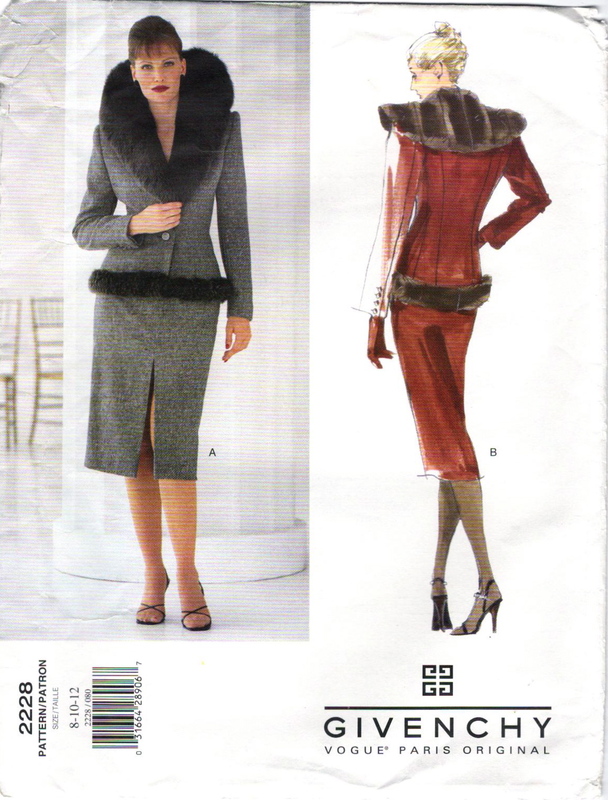 Although there are similar cowl neck looks in the collection, I couldn’t find the sleeveless version shown in the Vogue 2248 pattern illustration (view B). It seems it wasn’t a runway look. Update: The sleeveless version seems to have been worn under a jacket. See my post on making the dress. Givenchy ready-to-wear Fall/Winter 1998-99. Image © Thierry Orban / Sygma via Getty Images. 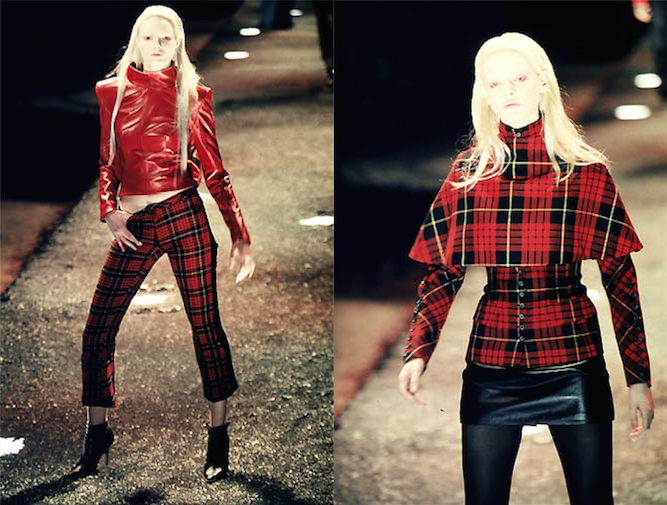 Parallel Alexander McQueen collection: Joan (FW 1998–99). Frankie Rayder in the Givenchy Spring 1999 ad campaign. Photo: Craig McDean. Vogue 2628 by Alexander McQueen for Givenchy (2002) Asymmetrical coatdress. Model: Colette Pechekhonova. 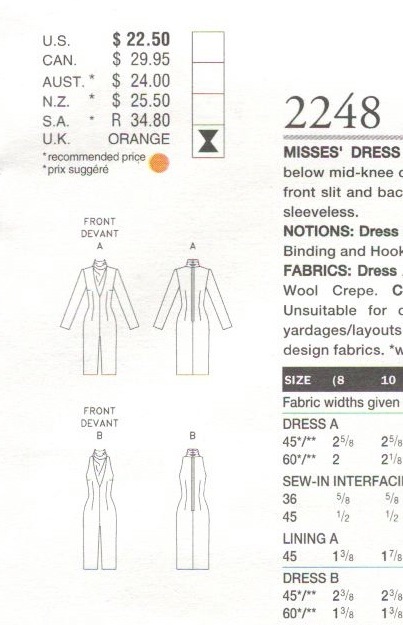 The envelope description reads: Misses’ Dress: Fitted, A-line, lined, double-breasted dress, above mid-knee, has collar, shoulder pads, seam detail (no side seams), welt pockets, flaps, shaped hemline and two-piece, above-elbow sleeves with mock vent/button/buttonhole trim. A: button tab. B: contrast collar. 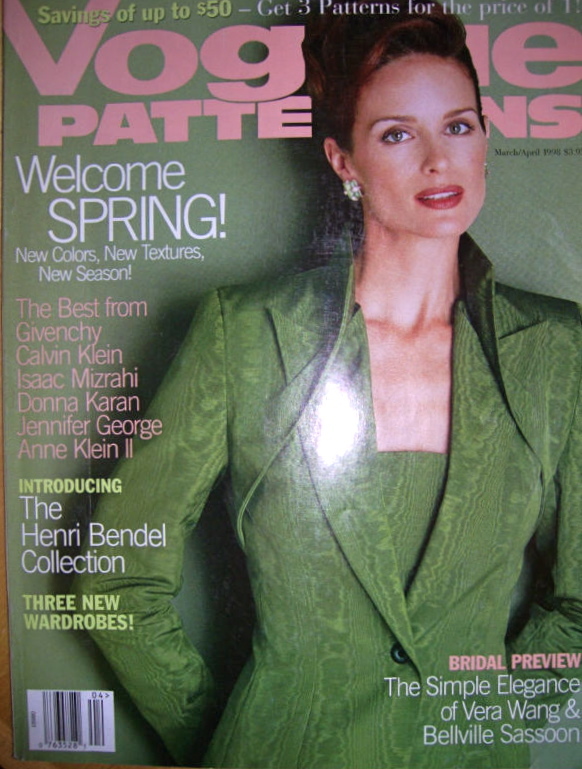 Featured in the April/May 2002 issue of Vogue Patterns magazine (Shop Vogue). Skirt suit, Givenchy ready-to-wear Spring/Summer 1999. Image: Corbis © Pierre Vauthey. 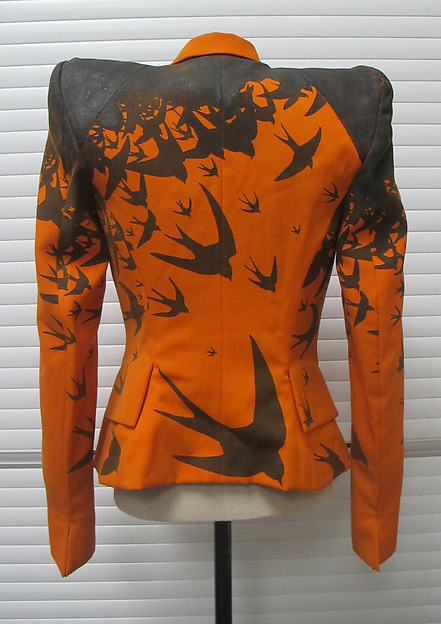 In fact, this look was shown just before ours: the back of this model is visible behind the model in the Vogue pattern photo. I thought I recognized the shoes with moulded toes from the Savage Beauty exhibit, but I see from the catalogue that those ones are from Natural Dis-tinction Un-natural Selection (Alexander McQueen Spring/Summer 2009). Givenchy Spring 1999 ready-to-wear by Alexander McQueen, L’Officiel 1000 modèles 1998 no. 2. Image: jalougallery.com. The same strapless Givenchy dress appeared in the Spring campaign and on the cover of British Vogue. 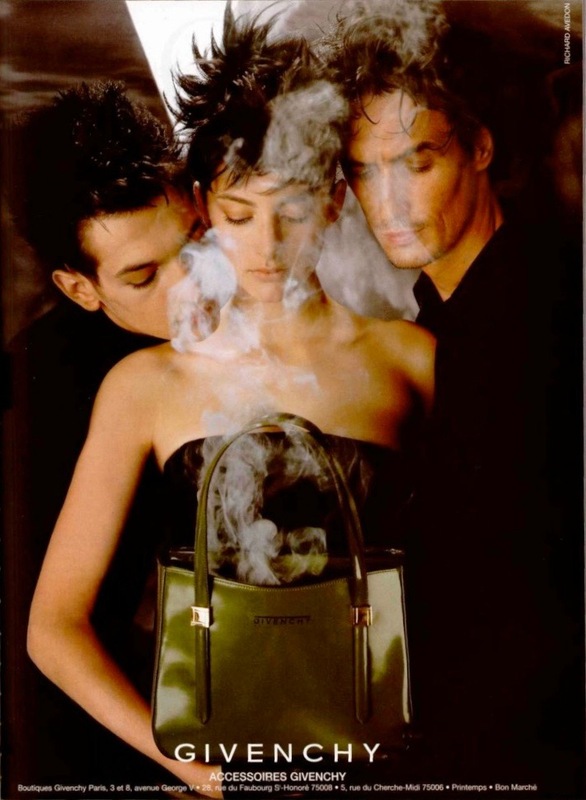 Givenchy Spring 1999 ad campaign. Photo: Craig McDean. Model: Frankie Rayder. Image: jalougallery. Elizabeth Hurley in Givenchy by Alexander McQueen, British Vogue, May 1999. Photo: Mario Testino. Editor: Lucinda Chambers. Image: Vogue UK. Givenchy by Alexander McQueen, Vogue Italia, Marzo 1999. 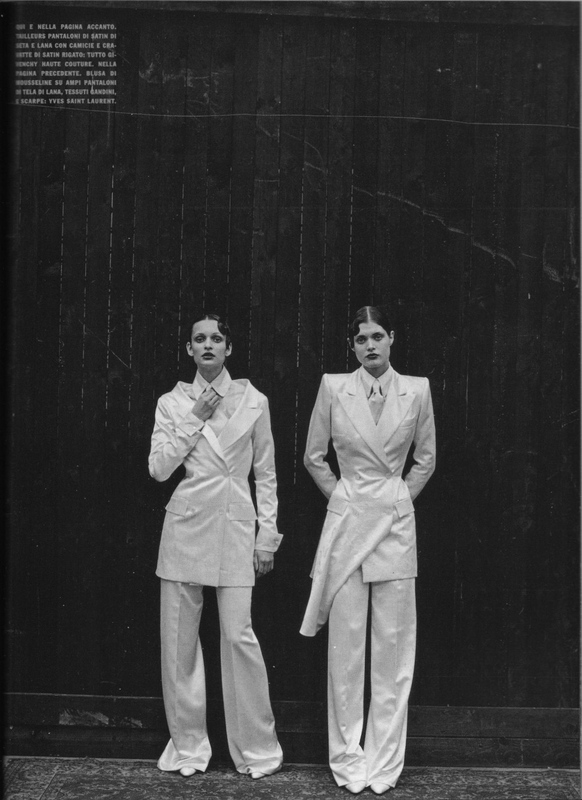 Silk satin and wool pantsuits with striped satin shirts and ties, Givenchy Haute Couture. Photo: Peter Lindbergh. Stylist: Nicoletta Santoro. 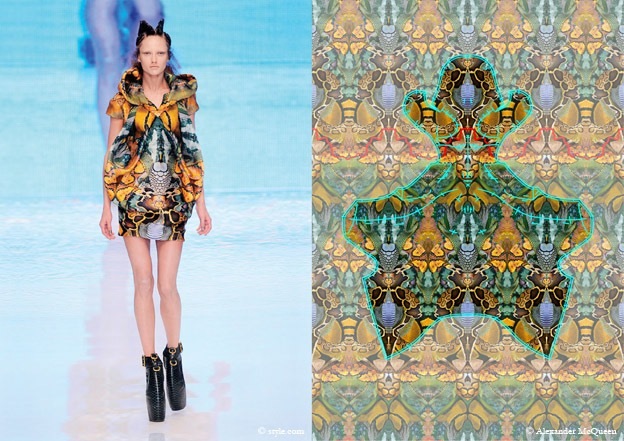 Parallel Alexander McQueen collection: No. 13 (SS 1999). 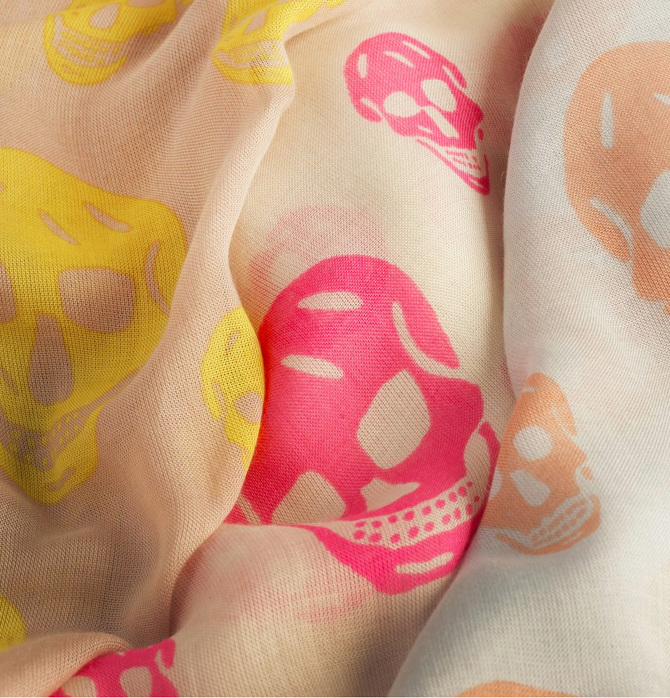 I would love to see photos of these patterns made up. Across the series of McQueen/Givenchy Vogue Patterns, though, the difficulty level ranges from Average to Advanced, so you could say they’re restricted to more experienced sewers. Which would you make first? 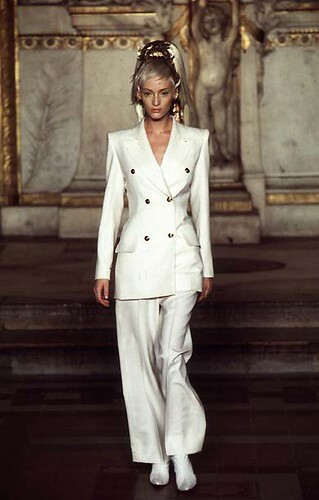 Next: Part 3: McQueen’s tailoring for the millennium at Givenchy. Honor Fraser in Givenchy by Alexander McQueen: Fall 1997 ad campaign by Richard Avedon. 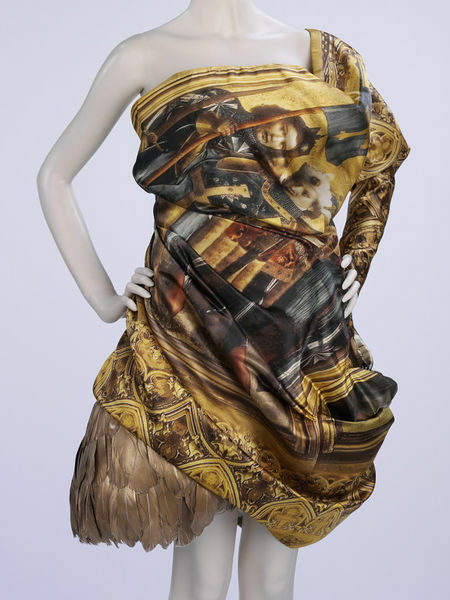 In honour of Alexander McQueen, currently the subject of the retrospective Alexander McQueen: Savage Beauty at New York’s Metropolitan Museum of Art, I’d like to dedicate my inaugural blog posts to some fashion ephemera with an interesting connection to the late designer. 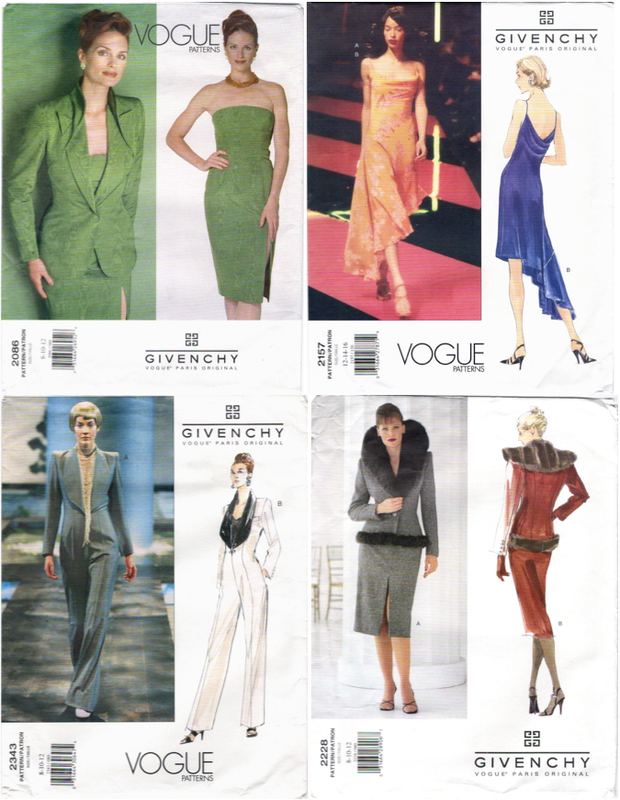 Between 1998 and 2002, Vogue Patterns released a series of licensed designer sewing patterns based on Givenchy designs by Alexander McQueen. These patterns provide an opportunity to study—as well as to recreate—a body of work by McQueen that is less well known than his work for his own label. Honor Fraser in Givenchy by Alexander McQueen, Fall 1997 ad campaign. Photo: Richard Avedon. 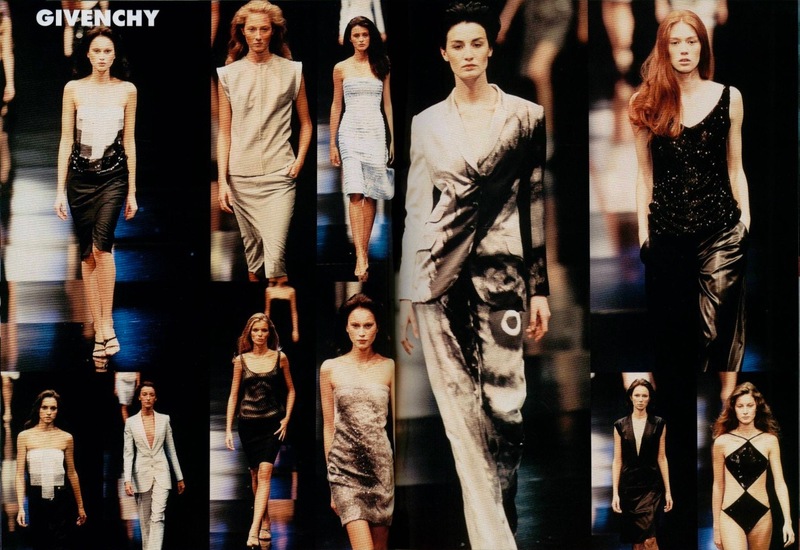 The eleven Vogue patterns represent seven collections presented by the house of Givenchy in the late 1990s. In my next three blog posts I’ll share the results of my project to match the patterns to the collections shown on the Paris runway. Vogue 2086 by Alexander McQueen for Givenchy (1998) Strapless sheath and jacket with pierced front. 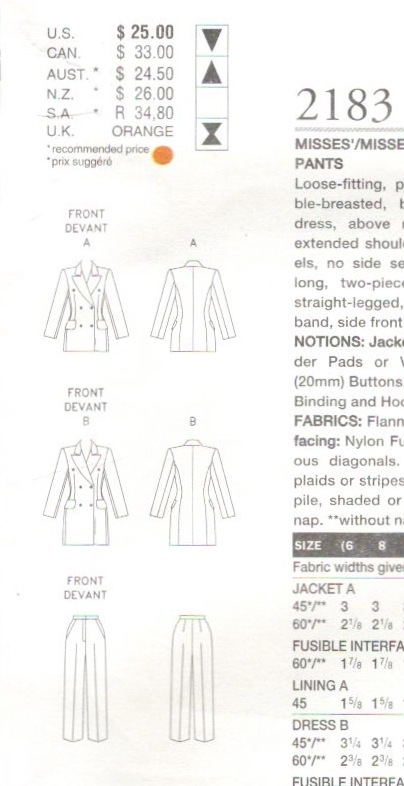 Here’s the description from the pattern envelope: Misses’ Jacket and Dress: Semi-fitted, partially interfaced, lined, below hip jacket has front shield extending into back collar with opening for lapels, shoulder pads, side panels, no side seams, side front pockets and long, two-piece sleeves. Close-fitting, tapered, lined dress, below mid-knee, has front princess seams, side front slit, foundation with optional bust pads, inside belt and side zipper. Givenchy by Alexander McQueen on the cover of Vogue Patterns, March/April 1998. Model: Jacki Adams. Photo: Paul Amato. Image: eBay. 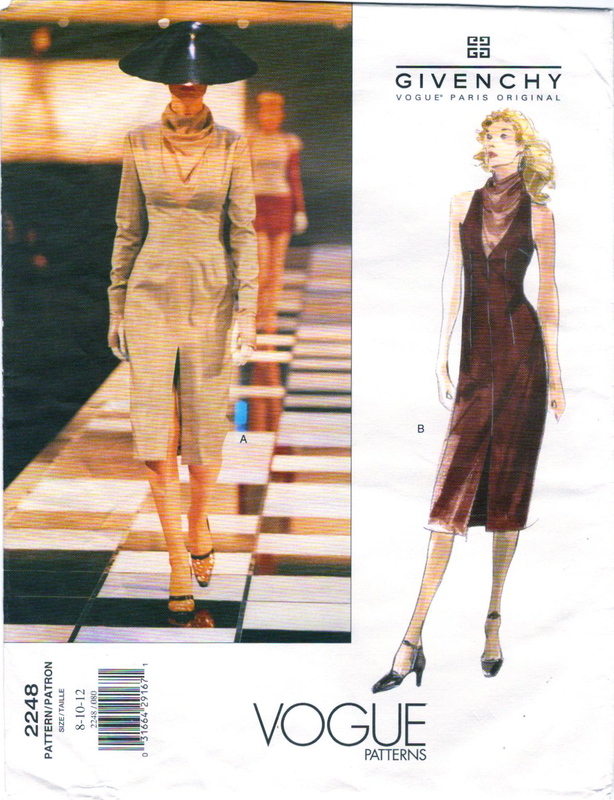 Vogue 2086 remained in print for at least two years: Vogue Patterns was still promoting it in the May/June 2000 issue of the magazine (Shop Vogue). Chandra North in Givenchy by Alexander McQueen, Vogue Paris, août 1997. Photo: Michael Thompson. Image: Voguegraphy. Vogue 2183 by Alexander McQueen for Givenchy (1998) Double-breasted pantsuit/coatdress. 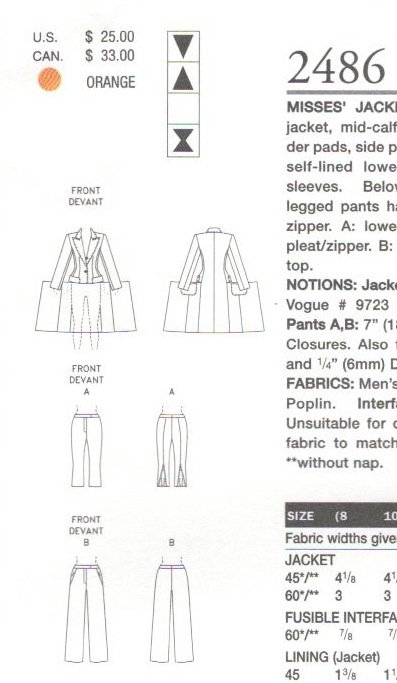 Here’s the pattern envelope description: Misses’/Misses’ Petite Jacket, Dress & Pants: Loose fitting, partially interfaced, lined, double breasted, below hip jacket or straight dress, above mid-knee, has collar, slightly extended shoulders, shoulder pads, side panels, no side seams, flaps, welt pockets and long, two-piece sleeves. Semi-fitted, lined, straight-legged, floor length pants have waistband, side front pockets and fly zipper closing. Featured in the November/December 1998 issue of Vogue Patterns (Shop Vogue). 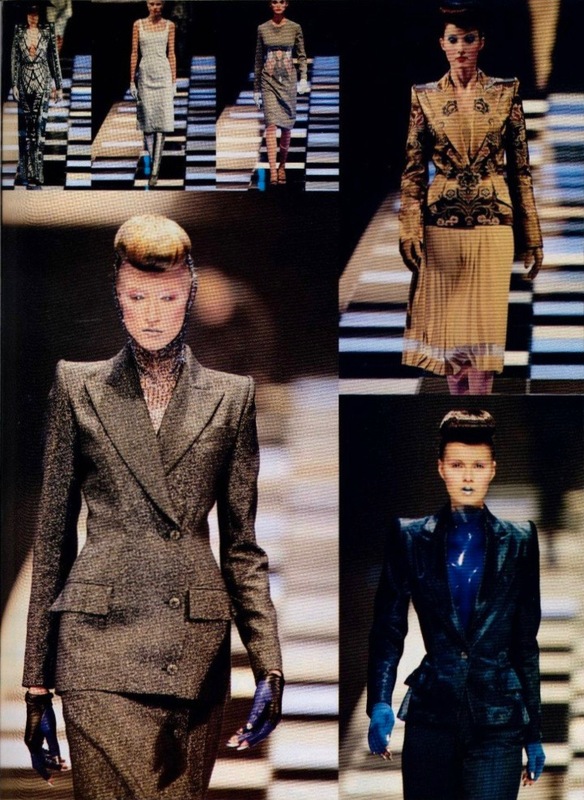 Givenchy Fall 1997 ready-to-wear by Alexander McQueen, L’Officiel 1000 modèles 1997 no. 6. Image: jalougallery.com. Amy Wesson in Givenchy by Alexander McQueen, FW 1997 RTW. Photo: Daniel Simon / Gamma-Rapho via Getty Images. Givenchy Spring 1997 couture by Alexander McQueen, L’Officiel 1000 modèles 1997 no. 4. Image: jalougallery.com. 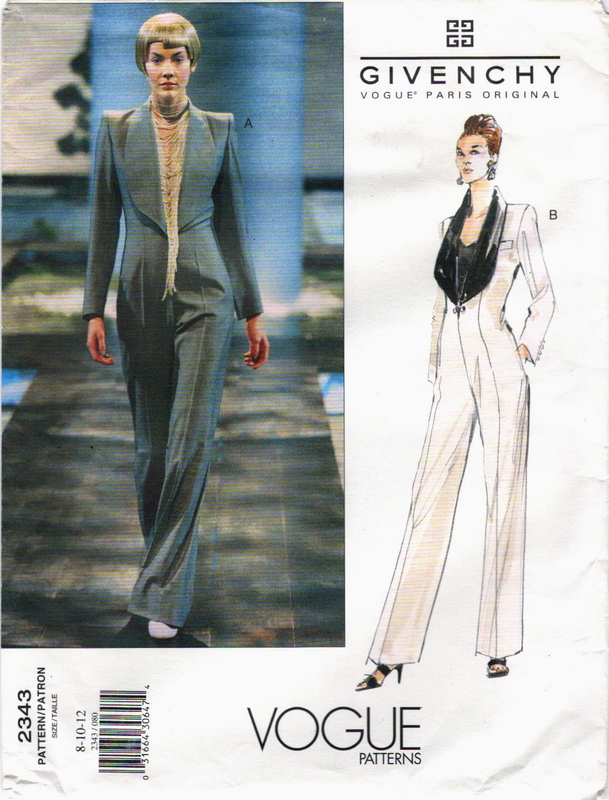 Flickr member pogisto has posted images for the entire couture collection; here’s the pantsuit. Amy Wesson in Givenchy Spring 1997 couture by Alexander McQueen. Image: flickr. Amber Valetta in Givenchy by Alexander McQueen, British Vogue, September 1997. Photo: Paolo Roversi. Image: TFS. Silk crepe bias-cut dress with gold ivy, Givenchy Haute Couture by Alexander McQueen, Harper’s Bazaar, May 1997. Photo: Craig McDean. Fashion editor: Melanie Ward. 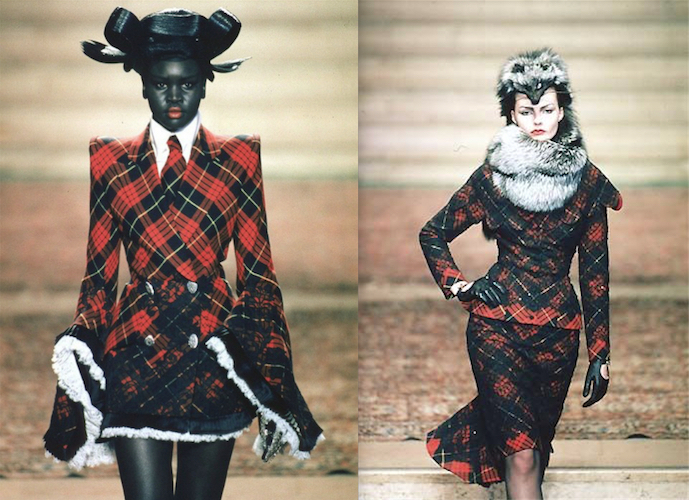 Parallel Alexander McQueen collection: It’s a Jungle Out There (FW 1997–98). 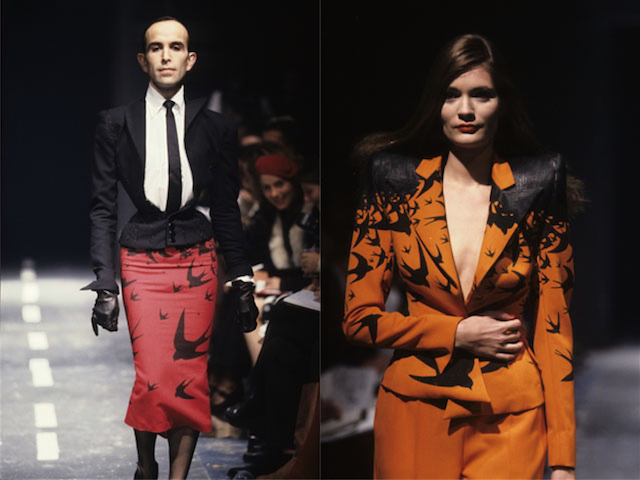 The Givenchy Couture collection that followed is Eclect Dissect (FW 1997–98). 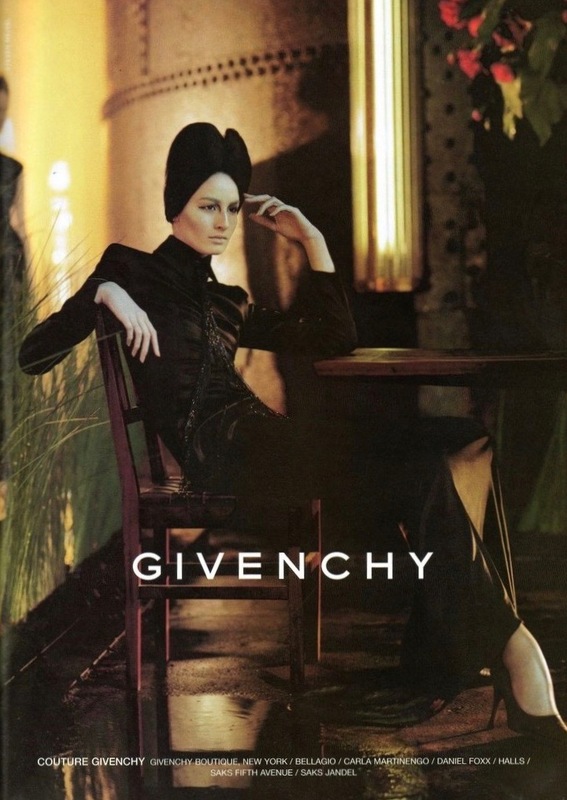 Honor Fraser in the Givenchy ad campaign, Spring 1998. Photo: Richard Avedon. Image: eBay. Vogue 2157 by Alexander McQueen for Givenchy (1998) Asymmetrical bias-cut dress. 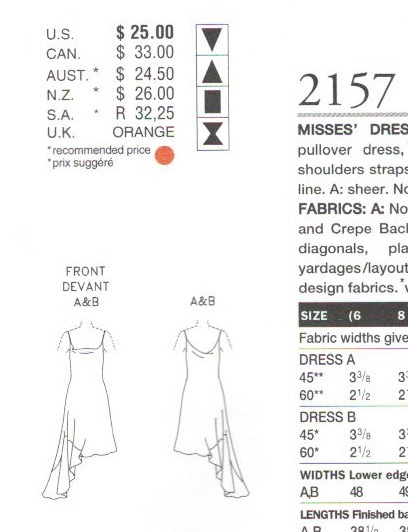 Envelope description: Misses’ Dress: Close-fitting, bias, flared, pullover dress, mid-knee (center back), has shoulder straps, seam detail and shaped hemline. A: sheer. Note: A is shown over B. 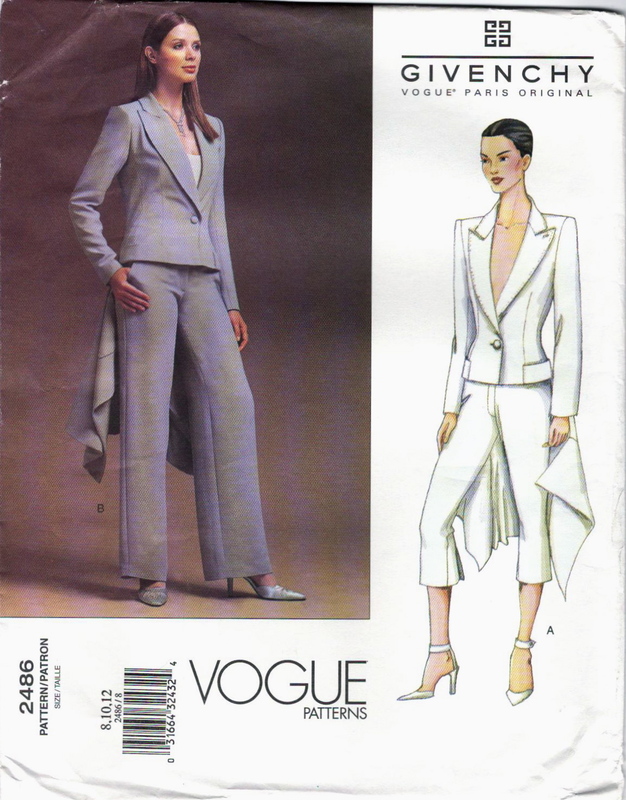 Featured in the July/August 1998 issue of Vogue Patterns (Shop Vogue ‘cover’). Givenchy Spring 1998 ready-to-wear by Alexander McQueen, L’Officiel 1000 modèles 1997 no. 9. Image: jalougallery.com. 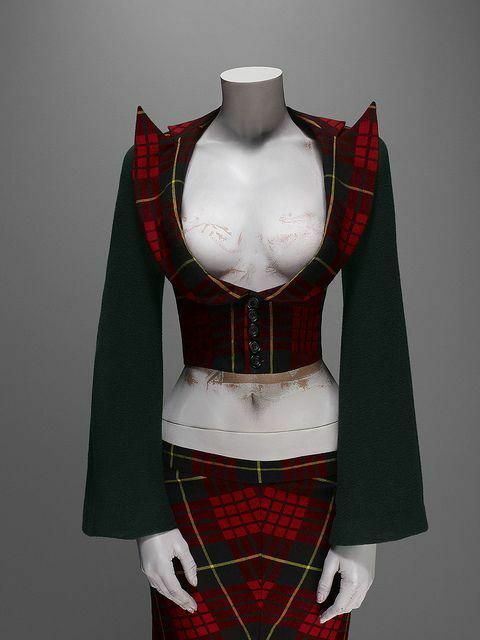 Parallel Alexander McQueen collection: Untitled (Spring/Summer 1998). Have you seen any of these patterns made up? Do the Givenchy designs show any connections to McQueen’s work for his own label? 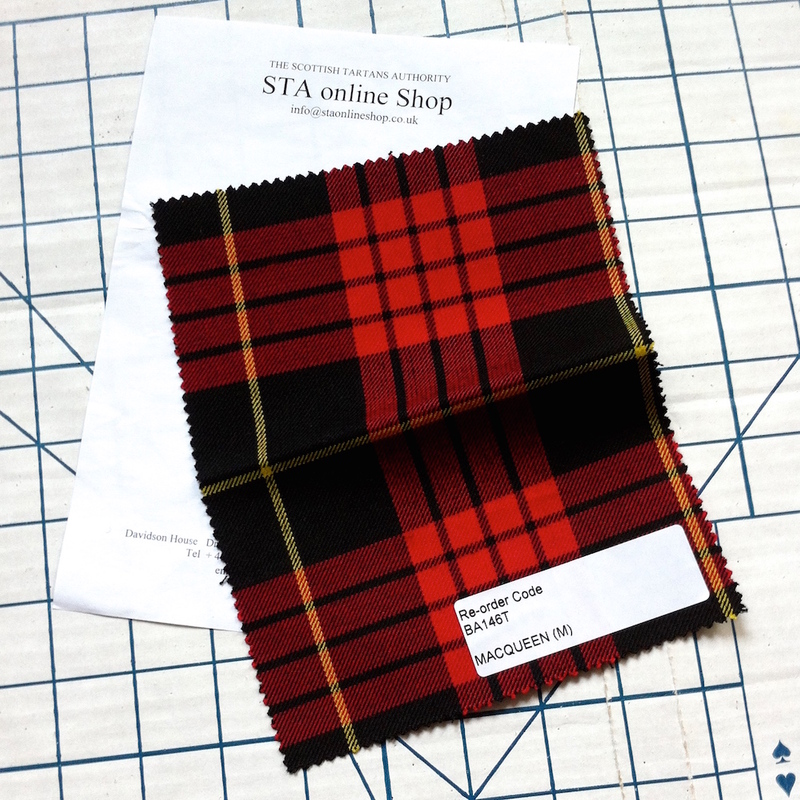 Bonus: SHOWstudio has a free Alexander McQueen pattern download—a kimono jacket from Scanners (FW 2003–4). See my post on the SHOWstudio pattern here. Next: Part 2: McQueen hits his stride at Givenchy.